These days, a corporate Twitter account is only as good as its ability to dunk on jokers, with Wendy’s being the shining example of brand ownage. Unfortunately, some corporate Twitter accounts represent entities that aren’t really suited for ownage, so it’s rare that they get the chance to go viral with a funny tweet about current events or an amazing reference to some hot meme. 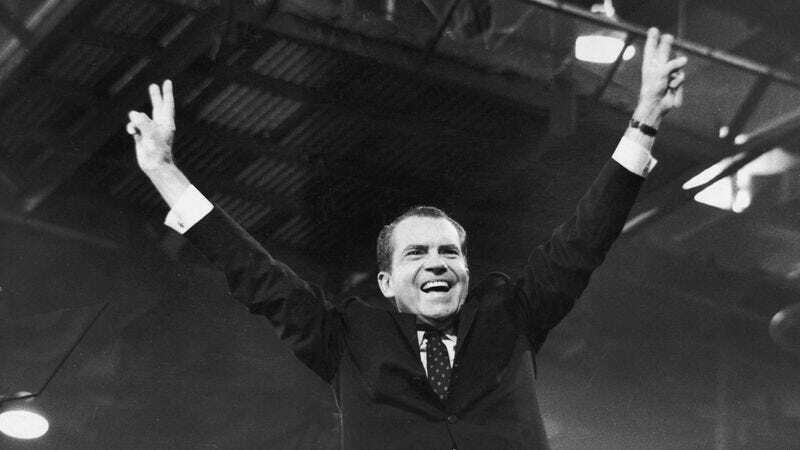 It seems safe to assume that the Richard Nixon Library’s Twitter account has never had an opportunity like that, since its main goal is just to avoid reminding people about the bad stuff Nixon did, but that all changed when Donald Trump decided to fire FBI Director James Comey in the midst of an investigation into possible ties between his administration and Russia. Vicious stuff. Note the sarcastic use of “FUN FACT,” the hashtag “notNixonian,” and the photo of Nixon smiling like someone who definitely did not fire the Director Of The FBI. It’s a masterpiece of the subtweet genre. Of course, sticklers for history have been quick to point out that Nixon did fire Archibald Cox, the Special Prosecutor who had been appointed to investigate his connections to the Watergate scandal, but that’s hardly important here. Sure, that was much worse than firing the Director Of The FBI in some ways, but wins like this are so rare for the Nixon Library that we should just let them have it. Everybody knows Richard Nixon was a pretty lousy president, but let’s all put that aside for one night and salute the Nixon Library for being very good at Twitter.